Student: A lot of dust on this Dyspnea diagram. Where did you get it? the comparison to Breathing “Discomfort” Memory. Student: Looks to me that your description had anticipated the discussion of Work / Effort subjective qualities published in: An American Thoracic Society Statement: Update on the Mechanisms … of Dyspnea 2012. Professor: Now I have downloaded several relevant articles for their section on Work / Effort. Student: I wonder how these articles expand on this schematic diagram. our 1970s analysis of end-of-exercise intensities of reported subjective qualities. Take Home Message: The subjective qualities of dyspnea appear to be neuroanatomically organized into a hierarchical manner. Next: The cluster analysis of the subjective qualities of dyspnea will be published on review page of this website, and the subjective qualities of Work / Effort as well as Tightness and Air Hunger / Insufficient Inhalation will be part three of the Dyspnea posts. Weiser PC, Henson DM. 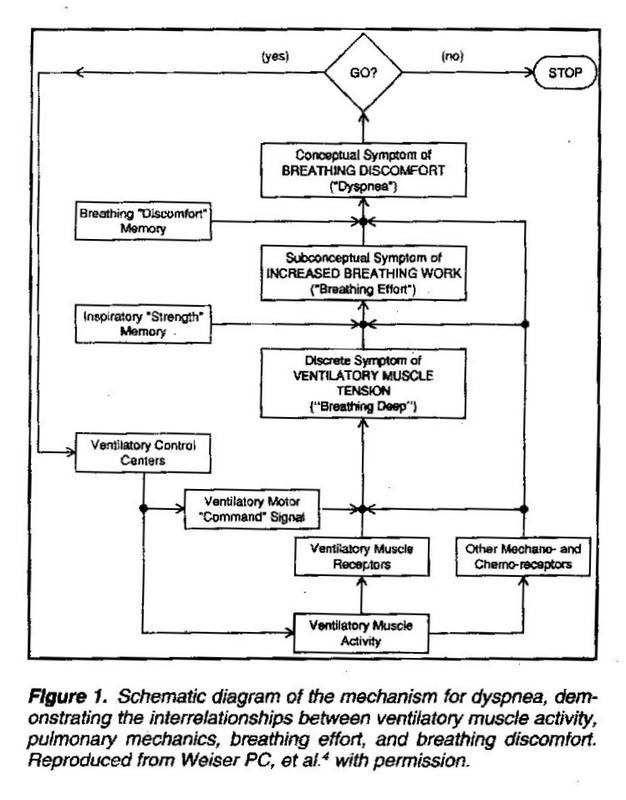 (1992) Mechanisms of Exertional Dyspnea in Patients with Chronic Heart Failure. Heart Failure 8:202-209.